The Japanese archipelago is in the grip of a cold air mass, and heavy snow is forecast to fall over the weekend, mainly between the northeastern and western parts of the Sea of Japan, the Meteorological Agency said Friday, warning of severe snowstorms and icy road conditions. The snowfall has already taken a toll. A woman was found buried under snow near her house in the village of Okura, Yamagata Prefecture, on Thursday night and later confirmed dead. She is believed to have been struck by a chunk of snow from the roof of the house, police said. Two elderly women were seriously injured Friday morning in Daisen, Akita Prefecture, and in Yamagata after falling while clearing snow, the police said. In the 24-hour period ending 11 a.m. Friday, 63 cm of snow was logged in the town of Minamiaizu, Fukushima Prefecture, 50 cm in Okura and 47 cm in Uonuma, Niigata Prefecture. 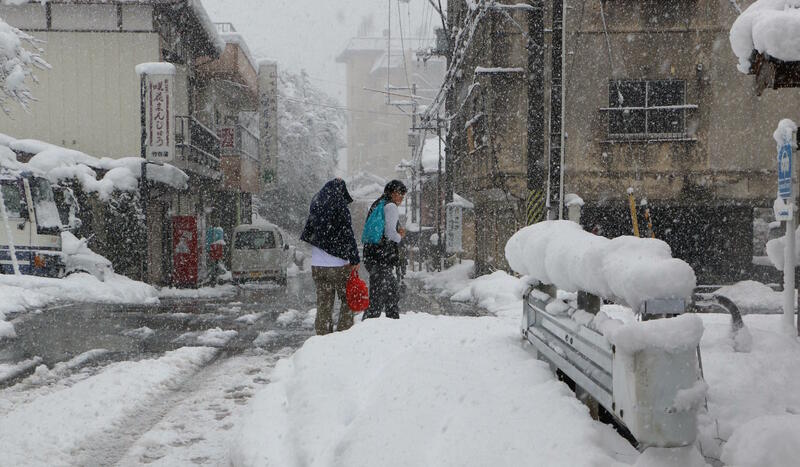 More than 2 meters of snow has accumulated overall in Okura and Aomori. Heavy snow is also expected to hit the Pacific coast on Saturday, coinciding with the first round of university entrance exams at most public and private schools, it said. Minister of State for Disaster Management Jun Matsumoto directed government ministries and agencies Friday to “prepare for possible traffic disruptions that might impede travel for students and staff. The Hokuriku region bordering the Sea of Japan coastal area is forecast to get up to 90 cm by 12 p.m. Saturday and 100 to 120 cm by 12 p.m. Sunday. 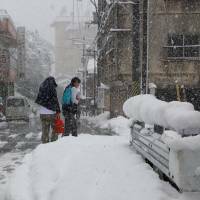 Overall, snow is expected to reach up to 70 cm by 12 p.m. Saturday in the Tokai region and the Kanto-Koshinetsu region and 60 to 80 cm by 12 p.m. Sunday. Other areas, including the Chugoku and Kinki regions in western Japan, will also likely see heavy snow, the agency said.